Over 10 years ago, I had one of my first poems published in Calyx, a home and haven for women writers and artists. 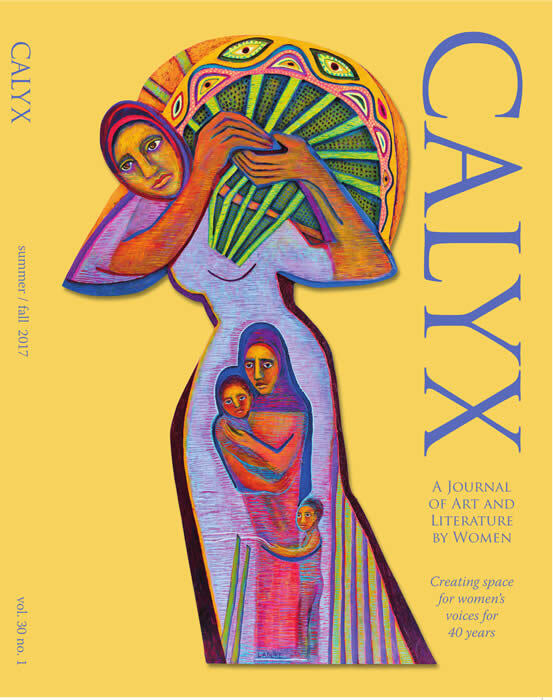 It feels full-circle to have my first book review of How Light Reaches Us, in Calyx’s Summer/Fall 2017 issue, by non-fiction writer Cindy Mom. HOW LIGHT REACHES US, Kristin Berger. Kelsay Books, Aldrich Press, 24600 Mountain Avenue 35, Hemet, California 92544, 2016, 72 pages, $14 paper, www.kelsaybooks.com. Kristin Berger’s dedication, to my loves (pg 5) tells us, even before reading any of the poems, that How Light Reaches Us is a book about passion. Berger’s loves are many and far-flung, and she embraces them all simultaneously: the parched desert and the lush forest, the domesticity of home balanced with a yearning for the wild, the comfort of the familiar and the allure of the unknown. If we take her dedication as a cue, we realize we don’t have to choose. We are given permission to love them all. Does your home country taste of hope? Do you have enough starlight to travel by? “Badger” (pg 44) was written as an accompaniment to a photograph taken by artist Gillian Vaughan and is just one example of Berger’s frequent collaborations with other poets, writers, and artists. As the recipient of two writer’s residencies at Playa, in the high desert of Oregon’s outback, she has adopted Playa’s value of exchange, where co-residents can learn from one another. “Our Own Private Alaska” (pg 23) is a collaborative work with poet Scot Siegel, and the book’s cover art “Thunderstorm I” was painted by Rakar West—both past residents of Playa. Another source of inspiration is the assemblage of colloquial, and sometimes antiquated, landscape terms found in Home Ground: Language for an American Landscape (Trinity University Press, 2006), edited by Barry Lopez and Debra Gwartney. Eddy line, coyote well, jaral, céja, desire path—These and eleven more can be found in an abbreviated, interpreted glossary in the Notes (pg 67). They make an indelible mark on this collection of poems. every hundred years with love letters it scrawls to itself. These two landscape-term poems and several others illustrate a strong woman’s place in the world. In “Mere” (pg 34), “Spur” (pg 36), “Stream Sink” (pg 54), “Thalweg” (pg 39), and “Despoblado” (pg 45), women work, dream, struggle, love, and change. “Kisstank” (pg 37) is not the only place to drink in the desert. Berger’s landscapes of silt, dust, baking heat, hardpan, and barbed wire are tempered with juicy figs, honey, melon, berries, a ripe plum. They don’t appear often, or in large quantities, but sprinkled throughout the book, they are enough to quench our thirst. In one poem, “Talus” (pg 58), these textures are placed directly next to each other in successive lines: cairn to scree / bush to berry. So, how does light reach us? It comes to us from a sliver of moon reflecting on the curve of a river, from deep within the blue heart of a glacier, flashing from a high-latitude stippled sea, searing us with the heat of a sage desert, glowing from within a jar of canned peaches. But these lines are merely rough paraphrases of Berger’s poetry. You must read the poems themselves to experience the most brilliant light. And isn’t that how most dreams are constructed? the swing-bridge waiting for us in the dark. More of Cindy’s work can be found at her travel & adventure blog, 45-60.